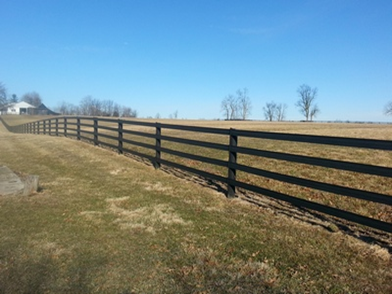 Kentuckiana is a Standardbred horse farm located in Georgetown, KY and has just about every combination of Centaur fence you can think of. In only 25 years of operation, Kentuckiana has bred or raised more million-dollar winners than any other Standardbred farm in the world. The farm’s millionaires are among the most well-known names in harness racing: Ball And Chain, Die Laughing, Firm Tribute, Follow My Star, Grinfromeartoear, Harmonious, Naughty But Nice, Riyadh, Royal Prestige, Staying Together and Triple Crown winner Western Dreamer. 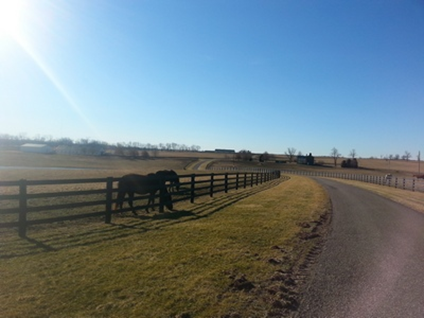 Kentuckiana was probably the first major farm in central KY to really put up Centaur fence. As Bob Brady, manager of the farm, likes to point out it took a Standardbred horse man to show the thoroughbred guys what fence to use. 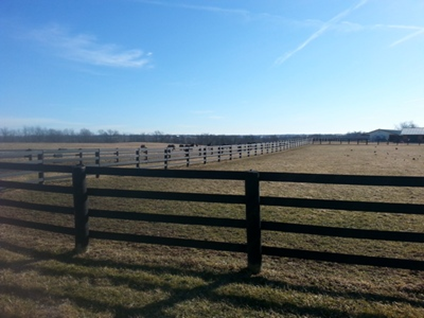 Kentuckiana was one of the first major farms in KY to install Centaur fence, the fence here is about 18 years old and all that has been done with it was some post repairs about 6 years ago. Other than that, nothing has been done to the farm. Another look at the farm along the road. Here is a after picture of the repair done when a tornado picked up a barn and dropped it on this fence. As seen on this page CentaurHTP.